As one of the web’s leading destinations for travel related news and information, the MSN Travel channel features a variety of content, including photos, videos and articles about travel destinations around the globe. With such rich content offerings, the channel receives millions of unique visitors each month. Providing an engaging user experience that maximizes pageviews is of paramount importance to MSN’s revenue model. 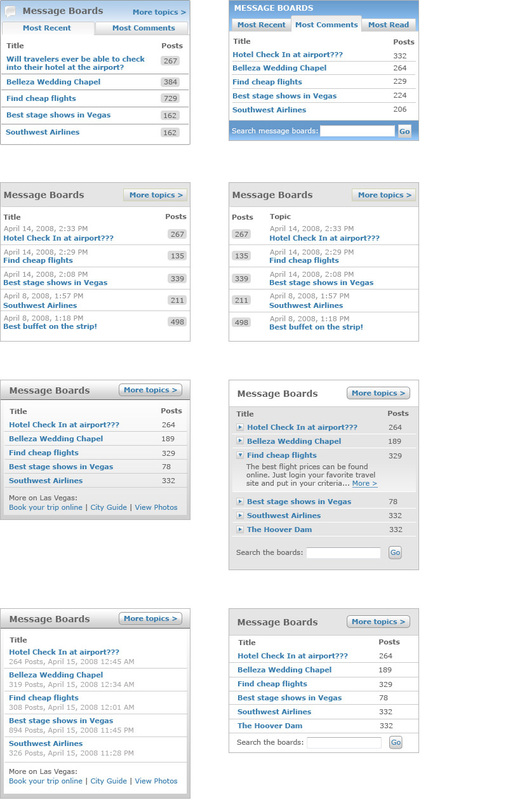 For this project, my task was to explore different layouts for the channel’s message board widget. My goal was to provide easy access and maximize clickthrough rates to the most popular message threads. Below are selected design variations presented for consideration.